Dennis Brain, through his concerts, broadcasts, and recordings, brought the horn into prominence as a solo instrument and became an inspiration to many for his technical and musical excellence on the horn. He was the son of Aubrey Brain, nephew of Alfred Brain, Junior, and grandson of A.E. Brain, Senior. Dennis was born in London in 1921. His father, Aubrey Brain, was third horn in the London Symphony and Royal Philharmonic orchestras at the time. His mother, Marion Beeley, was a contralto who sang at Covent Garden and for whom Sir Edward Elgar wrote the aria “Hail, Immemorial Ind!” in his opera The Crown of India. Dennis attended Richmond Hill Preparatory School, St. Paul School, London (where he sang in the choir), and the Royal Academy of Music, where his father taught horn. In addition to horn lessons with his father, Dennis also studied piano and organ, playing organ in public occasionally over the years. He started playing horn professionally while still at school and astounded his school mates with his incredibly fast, articulate playing. When war broke out in September 1939, both Dennis and his brother, oboist Leonard Brain, and some of their friends cut short their studies at the Royal Academy and joined the Royal Air Force, where they played in, first, the RAF Central Band at Uxbridge, and then, for the remainder of the seven-year hitch, the RAF Symphony Orchestra. During all this time, Dennis and the others also took jobs in outside ensembles (London Wind Players, London Baroque Ensemble, etc.). The orchestra toured the US in 1944; when the tour took them to Los Angeles, the Brain brothers stayed with their uncle, Alfred Junior (known as Alf), who played principal horn in the Los Angeles Philharmonic. The RAF orchestra played for a series of broadcasts to America called An American in England, for which Benjamin Britten was the composer. Dennis demonstrated what he could do on the horn, which inspired Britten to write the Serenade for Tenor, Horn and Strings for Dennis and tenor Peter Pears. Dennis began the Dennis Brain Wind Quintet while still in the RAF, and later expanded it to the Dennis Brain Wind Ensemble. 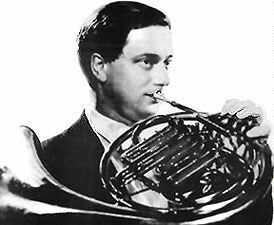 He was principal horn in the Royal Philharmonic Orchestra starting with its founding in 1946 and including a tour of the US in 1950, but his obligations to the Philharmonia Orchestra, formed in 1945, resulted in fewer and fewer services with the RPO. The Philharmonia toured the US East Coast in 1955. Dennis kept an amazingly busy schedule, often driving from one engagement to another. He loved his cars and was known for having automobile magazines on his music stand during rehearsals, even when he was the soloist. He made an incredible number of broadcasts with the BBC and recordings in addition to concerts. His recording of the four Mozart horn concertos has never been out of print. His supreme artistry inspired many composers to write new works for the horn, including (in addition to Benjamin Britten) Paul Hindemith, Malcom Arnold, Sir Lennox Berkeley, York Bowen, G. Bryan, Peter Racine Fricker, Gordon Jacob, and Elisabeth Lutyens. Dennis played a Raoux single F horn at first, gradually moving to an Alexander single B-flat horn. He also experimented with a number of other horns, including five-valve horns. His uncle Alf gave him a small mouth that he used for the rest of his life. As a teacher, Dennis generally demonstrated but, because he was such a natural player, had difficulty explaining how he did things or how to solve students’ problems. He developed lecture/demonstrations on “The Early Horn” and “Talking about the Instrument: The Horn” for the BBC and wrote articles on “French Horn Playing” and “About the French Horn” for various journals. Toward the end of his life, Dennis showed interest in conducting more and in playing horn less. He was killed in a car accident on September 1, 1957 while driving back to London from Edinburgh, where he had just played in several concerts at the Edinburgh Festival.